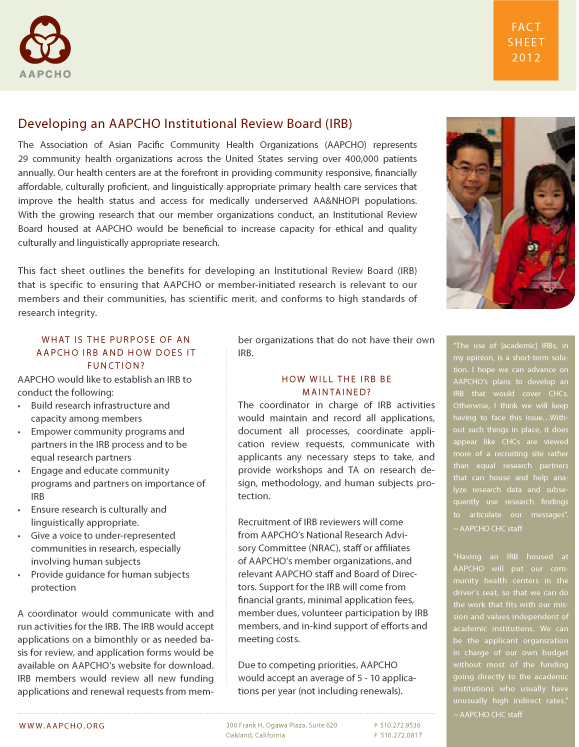 In an effort to increase AAPCHO member health centers’ capacity to conduct ethical and culturally and linguistically appropriate research, AAPCHO developed an in-house Institutional Review Board (IRB), which helps ensure that AAPCHO or member-initiated research is relevant to member communities and is conducted with high standards of research integrity. Provide a strong foundation of knowledge to facilitate the conduct of health services research at AAPCHO and AAPCHO member organizations. 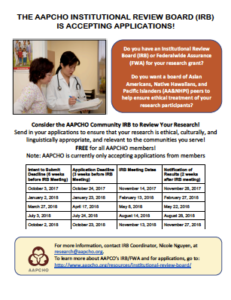 AAPCHO IRB reviewers are from AAPCHO’s National Research Advisory Committee (NRAC), and include staff or affiliates of AAPCHO’s member organizations and relevant AAPCHO staff and Board of Directors. The IRB accepts applications on a quarterly or as needed basis for review. Due to competing priorities, AAPCHO would accept an average of 4-8 applications per year (not including renewals). AAPCHO’s IRB currently only reviews applications from AAPCHO members due to limited resources and capacity. Organizations interested in listing AAPCHO as their preferred IRB on their Federalwide Assurance (FWA) application must complete the Institutional Review Board (IRB) Authorization Agreement Form A.